26 photos of this vintage train, owned by WCRC since 2008. 57302 Virgil Tracy, 1Z58, Docker, Fri 7 November 2008 - 1502. 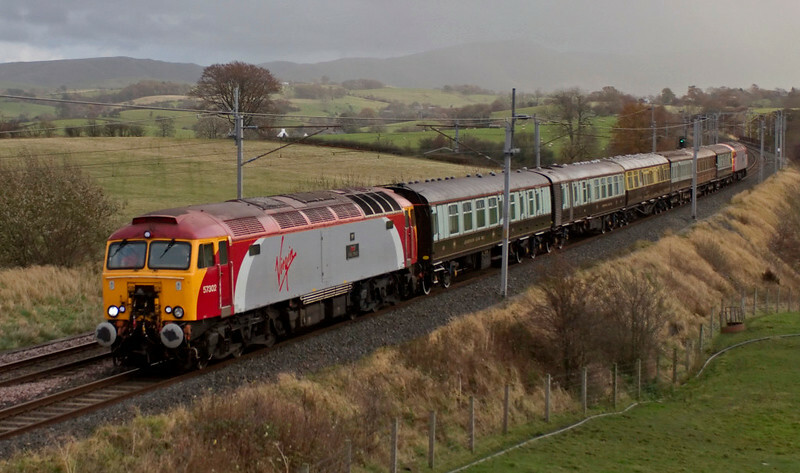 The return leg of a private charter from Stoke to Carlisle, worked via Settle by 57312 seen here on the rear. The train was formed of the Queen of Scots stock: BR Mk 1 service cars Nos 2 & 1 (99035 & 99886); 1930 GWR first class saloon No 9004; 1891 LNWR dining saloon No 159; 1912 GNR first class saloon No 807; and Caledonian Rly saloon No 41, originally bult in 1892. These are the oldest coaches authorised to run on the national network. This train almost cetainly ran in connection with the train's purchase by the West Coast Rly Co.